LANCASTER – The Lancaster High School Robotics Team is riding high after a successful showing at the Inland Empire FIRST Robotics Competition regional event in Grand Terrace this past weekend. Team 399: Eagle Robotics competed their robot, Cortex, and won the first five matches in a row. The team finished the qualification matches with an 11-2 record and seeded 2nd. In the elimination matches, they were in an alliance with the number 1 seed and went on to win the competition and be crowned the regional winners. 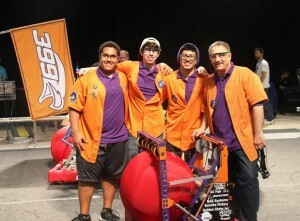 (L to R) Christian Pereira, Ivan Salazar, Victor Ruiz, and David Voracek break for a picture with the team’s robot, Cortex. The team was also honored with the coveted FIRST Chairman’s Award for the regional event. The Chairman’s Award is the most prestigious award at FIRST; it honors the team that best represents a model for other teams to emulate and best embodies the purpose and goals of FIRST. 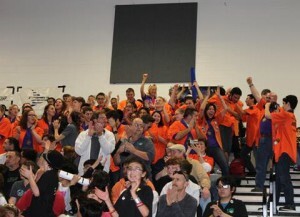 The team had a lot to celebrate at the regional event. To win the Chairman’s Award, the team had to submit an essay, create a video, and present information about the team to a panel of judges. The team’s mentor, David Voracek, was also honored with the Woodie Flowers Finalist Award. The Woodie Flowers Finalist Award is presented at each regional event across the country to an outstanding mentor who best leads, inspires, teaches, and empowers the team. Voracek is the Center Chief Technologist at NASA Armstrong Flight Research Center, and this is his ninth year mentoring the team. Team 399 has now qualified for the FIRST Robotics Championship Event, which takes place April 23-26, 2014 in St. Louis, MO. Team 399 will compete in two more regional events prior to heading to the championships. They will be at the Utah Event in West Valley City from March 13-15, and then they will finish the regional competitions in Las Vegas, NV from April 3-5, 2014. The team was also very happy for the two other Antelope Valley teams competing at the same event – Antelope Valley High School (AVHS) and The Palmdale Aerospace Academy (TPAA). Both teams have worked in the Lancaster Team shop over the past several weeks building their robots. Last year, TPAA shadowed the Lancaster Team, and this year, TPAA built their very first robot. AVHS was the 5th seeded team after qualifications, with a 9-4 record. They made it to the semi-finals but lost to Team 399. TPAA was chosen by AVHS for their alliance. TPAA was the highest ranked rookie team, and was also honored with the Rookie All-Star Award, which qualified TPAA for the Championship Event. Editor’s Note: The Lancaster High School Robotics Team 399 needs to raise about $15,000 to travel to the FIRST Robotics Championship Event in April. The team is seeking financial donations to offset travel costs for many students who cannot afford to travel. For more information on how you can donate to this worthwhile cause, contact the team here or email team399@gmail.com. 1 comment for "Lancaster High School Robotics Team wins FIRST Chairman’s award"
Congratulations to the team and to Mr. Voracek- all your hard work and dedication paid off!! Whoot whoot! !